i only have about another month with you. do you like the moro too? then the moro is out of season. other varieties of the blood orange are available until may. i bought all of the remaining decent-looking moro oranges at the local co-op. it was only seven total. i think bozeman's supply is fading. i ate one last night, and it was good as usual. mine have so much more red. i bought eleven oranges today. bluet: where do your oranges come from? mine come from california, u.s.a.
i just had to juice my last three oranges because they were so ripe. i don't know if there are any left here in stores that aren't over-ripe. i made orange bread with the juice. good, but i wish it tasted more like the moro. instead, it tastes more like the zest from the lemon and tangerine that i put it as the recipe suggested. i'm going to look for some tonight, then! I got 2 kg of moro goodness today. looks pretty interesting. make it! I'm so pissed, none of the stores around me are carrying blood oranges! Looks like it's time to hit up a few farmers' markets. had some for brunch today. > looks pretty interesting. make it! I wonder if the rind in there is overpowered by the rest of the sweet stuff. I hope so. And wow that is an awful photo...someone should make it and take a better one. i wouldn't waste a good moro on that recipe, tbh. are they on the way for the 2011 season? to be honest, i only enjoy the moro when i'm not super depressed (i.e., i liked them in 2008 and 2009, but not in 2010). I couldn't find *any* blood oranges last year. I'm pissed. i went to the local food co-op and bought two for $1.40. i went upstairs to sit and finish installing drivers on the p2110. a girl noticed that i was searching for an outlet, so she offered to plug my cord in for me. i gave her a blood orange. she was studying linear algebra. she enjoyed the moro--she didn't think it would be so tart. mine was good as well. i bought three more on my way out. and just devoured one. i intend on buying a gigantic supply tomorrow. You should have befriended her, larz. She sounds like your kind of girl. I want to try some blood oranges...I hope they are plentiful here, too! i asked her name, and she seemed reluctant or nervous, so i said goodnight and walked away. étrangère, you should get some fantastic cherimoya! "interesting" regarding the girl story or the fantastic cherimoya? i shared one moro with sarah (my coworker) and we thought it was kinda bitter and not very good. the remaining two were pretty decent. those little guys are hit-or-miss. the grocery store in the basement of my office building finally has some. i bought 7 today. the co-op got in some large "blood oranges." they aren't very tart. i don't think they're moro. i need to go back and pick out all of the decent small ones before they spoil! we have these where I work and I've yet to try one. I think we're getting a fresh box soon though, so I'll grab one out of that. Still not a single god-damned blood orange... GRRR. i bought another eight today, but i am giving at least six of them away. i bought three. not bloody enough. there should (hopefully) be some of these at work today. I just read way too many wikipedia articles about fruit. I had a good one this morning with a cup of coffee. I kind of wished it was a grapefruit though. 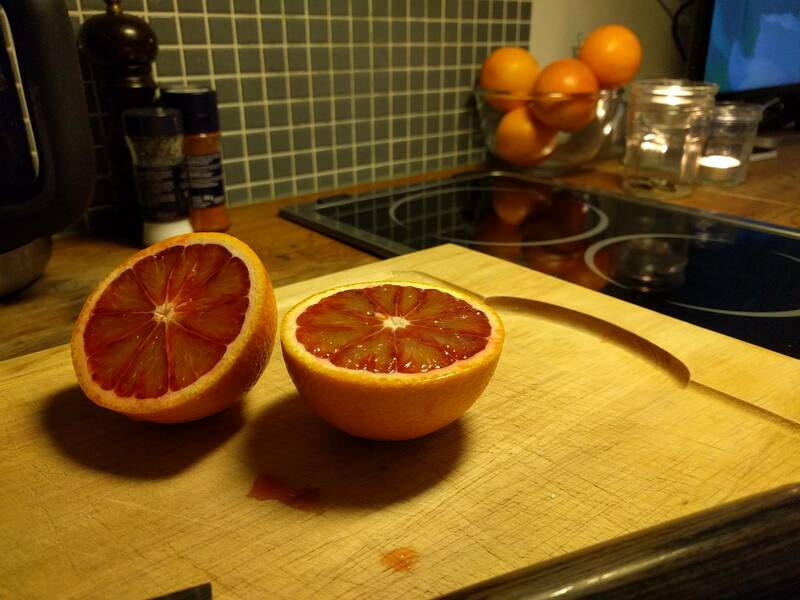 my first trick would be to make grapefruits as convenient to eat as oranges. Grapefruit + salt = yum. Just sayin. I'm eating a blood orange tea cake right now. so i finally found some in santa barbara--whole foods. they have two kinds. organic grown by a local orchard, and sunkist brand (also from california). both legit moro. I've been eating Italian ones all winter. Some are a bit on the orange side, though. i have been eating italian and lately california. so jealous you live right next to the source! brooklyn italian ain't bad... miss it. loaded up on some california moro today. yeah, i've been hitting them, too. haven't had a truly outstanding one yet, though. the season is coming to an end. there's only like one guy at the farmer's market with blood oranges right now. and i'm skeptical that they're any good. to be fair, though, our precipitation season ran very late this year, so who knows. where else can you get a good ph.d. in economics and a locally grown blood orange? the sicilian moros are here!